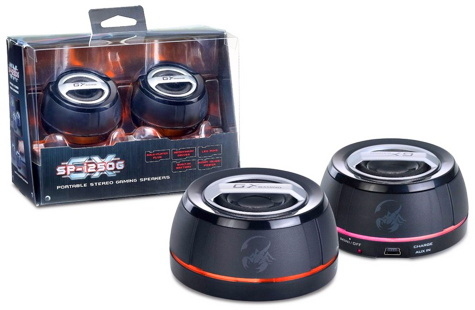 This little pair of rechargeable speakers produces reasonable sound quality considering their diminutive size. The pair of 40mm neodymium driver speakers (about an inch and a half across) are in cases that are a little less than 3 inches in diameter. You can’t really expect room-filling, quality sound from speakers of this size. 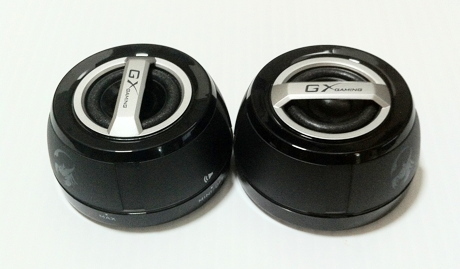 However, these speakers can replace the built-in laptop speakers with much better stereo sound. An all-in-one cable bundle is included. Mini-USB plugs connect to the speakers. The cable then splits in the middle to provide a normal-sized USB plug and a standard 3.5mm stereo audio plug at the other end. The audio plug is the input from whatever source is used—iPod, iPad, iPhone, or computer. The USB plug is used solely to charge the lithium batteries which are claimed to last “up to eight hours.” A recent test exceeded eight hours before recharging was required. If the USB plug is plugged in, the unit doesn’t need battery power. The sound quality is passable for speakers of this size. The high and low ends seem a bit pinched while the mid-range is boosted resulting in a slightly hollow sound. Each speaker case twists to turn on as well as to adjust the volume. Each has to be adjusted separately, a minor inconvenience or asset depending on the listener. However, it’s easy to just turn them both up full and then adjust the volume from the source. Ever wonder what the term “gaming” actually means when used to describe a computer, a mouse, or these speakers? Edgier, more powerful, sexier? Each of these speakers has an illuminated ring around the base that slowly pulses in rainbow colors. It’s very distracting and surely the LEDs must drain the batteries faster than using them without lights but unfortunately, the speakers can only be used with the pulsing glow. The set includes a pair of nice black drawstring bags for carrying, but each speaker has only a narrow 3/8″ bar across its cone as protection. The large empty spaces on each side of this allows fingers to easily touch the delicate cone and its foam surround. Even inside the drawstring bag, a speaker could easily be damaged by a poke or a pointed object. The pros just outweigh the cons here. The sound is adequate considering the size, the speakers are packably compact, and the battery life is quite good. The distraction from the pulsing lights and the hollow sound quality lowers the overall score.